Buy Small Leaved Lime Tree online from UK tree supplier of cell grown broadleaf hedges and shrubs. 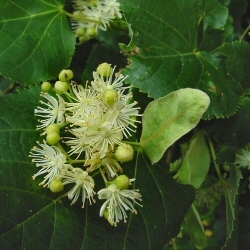 A native, British tree in England and Wales, the Small-Leaved Lime (Tilia cordata) is marked by its elegant foliage and the bright star-type flowers, which are sweetly scented. These are followed by small round seeds. Its leaves are a leathery texture, glossy dark green above, pale green with reddish axilliary tufts beneath. Expect a final height of 38m (127ft). Typically, Small-Leaved Lime is planted in groups of between 10 and 25 trees. This number of trees is ideal for creating a wildlife habitat and a meaningful source of food and shelter. Spacing may vary between 1m (3ft 4in) and 5m (16ft 8in). The aim is to mimic what nature intended and thus avoid artificial lines. Blending of one species into another is suggested although bearing in mind different growth rates. The Small-Leaved Lime is a minor native tree species and along with the many other native, British tree and shrub species we sell will form part of an attractive native woodland. We offer a range of tree shelters that will protect your trees against possible attack. Click on this Tree Protection Link and it will take you to all of these products.